On Sale Now! Save 2% on the CY USB 3.1 Type-C USB-C Dock Station to HDMI & Two 3.0 Hub & Gigabit Ethernet & Power Multiple Digital AV Type-C for Samsung S8/S8+,Note8,S9 and Huanwei Mate10/Mate10 Pro/P20 by CHENYANG at Pacs BG. Hurry! Limited time offer. Offer valid only while supplies last. 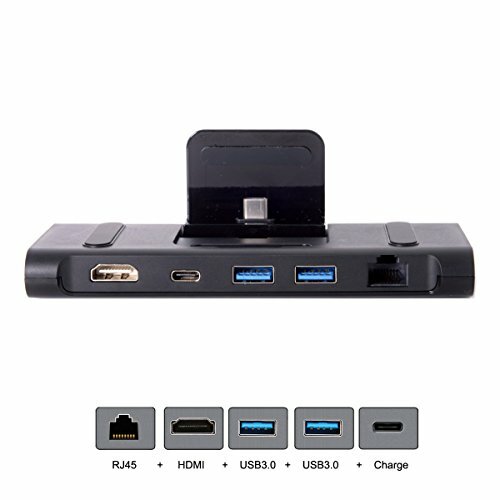 USB 3.1 Type-C USB-C Dock Station to HDMI & Two 3.0 Hub & Ethernet & Power For S8 S9 Mate10 P20.The Dock works for Samsung S8/S8+,Note8,S9 and Huanwei Mate10/Mate10 Pro/P20. input: USB type-C; output: USB3.0*2, Ethernet*1, HDMI*1, Type-C female*1 . Multiple USB 3.1 interface support plug and play. hot swap, easy to use and carry. The USB-C Digital AV Multiport Adapter lets you connect your S8 S9 Mate10 with USB-C port to an HDMI Projector display(4K 30hz max. ), while also connecting a standard USB device and a USB-C charging cable. Support over current and unstant current protection.You can also connect a charging cable to the USB-C port to charge your cell phone. Support USB 3.0 5Gbps full speed transmission.Gigabit Ethernet port allows the phone to access the network, provides superfast network speed.